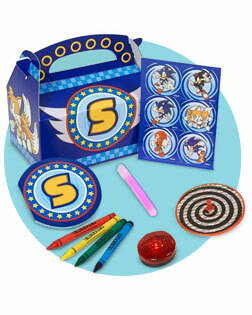 Help them go fast at the next big birthday bash when you get all sorts of amazing items from the Sonic the Hedgehog Party Supplies! There is tableware (plates, cups, etc) to help make the big meal fit the theme as well as easy to clean, favors so your guests will remember the fun they had, and decorations featuring Sonic, Tails, and the rest of the Sonic gang! Fire up the console and bring in the hedgehog. It’s Sonic time. The best kinds of parties can transport you and your guests to another planet, to somewhere they’ve never been before but always wanted to go. So get ready to sport your Sega blue and be whisked away to Mobius as you throw your child the most epic Sonic the Hedgehog party the universe has ever seen! If your child is a fan of Sonic the Hedgehog (and really, who isn’t?) 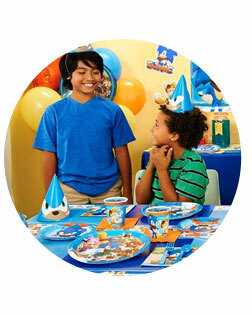 Birthday Express has everything you need to create a wonderful and memorable day for the special birthday boy or girl. I hope you’re ready for adventure, ‘cause here we go! We know how much goes into planning a party. Invitations, food, favors and activities all take time to plan and prepare. Prioritize each item and make yourself a list. Try to plan it out so the day of the party is reserved for finishing touches, not spinning around town like Sonic with his tail on fire. We know a thing or two about throwing an awesome birthday party. It’s kind of our thing. With that in mind, we want to help make it your thing, too! Check out our Ideas Blog for a flurry of helpful hints. Whether you’re throwing a specific party or just looking for some helpful hints, the Ideas Blog is the place to be. One of the first things on your list should be to send out the invitations, so why not do it with style? 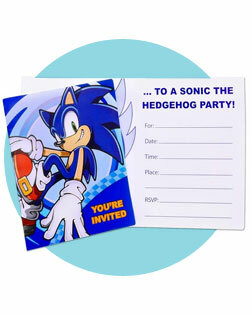 With the Sonic the Hedgehog Invitations, you let your guests know the details of the event and get them excited to spend a day with you, your child and the fastest hedgehog this side of the Milky Way. Themed decorations offer a great way to get you and your guests in the mood to party. They are what makes the difference between a simple, quiet get-together and a rocking good time, and we’re the one-stop shop when it comes to this blue speedster. Decorating won’t just be a breeze; it’ll go lightning-quick! The Sonic the Hedgehog Balloon Bouquet is perfect for inside on the table or outside on the mailbox. It comes with ten total balloons, blue and white curling ribbons and a blue balloon weight. The Express Value makes this decoration a no-brainer. Make your little birthday guy or gal feel super special with the Sonic the Hedgehog Personalized Banner. This heavy-duty vinyl banner is Sonic blue and easy to customize. It also comes in three different sizes to fit your party space with ease! Those table decorations and hanging decorations are great for the party atmosphere, but what about mealtime? Does Sonic take a breather from fighting the evil Dr. Robotnik if he gets hungry? Of course not! So if you’ve got a Sonic-themed cake or a Sonic-blue punch for the kids, there is no better way to serve it up than with the Birthday Express collection of Sonic the Hedgehog tableware! We’ve got the cups, plates, Sonic-themed napkins, placemats and even water bottles to make your party a truly special event for you and your family. It’s not every day your child turns another year older. Of course you want the food to be good and decorations to be done just right. But as you strive to capture these precious milestones, it’s oftentimes the fun things you and your guests do together that create the most lasting memories. We’ve got all the bells and whistles to take your gathering to Super-Sonic heights and have everyone smiling and laughing. Our array of Sonic the Hedgehog-themed activities is just what your party needs to go from cake and ice cream to an all-day festivity! Not interested in a regular party, are you? Looking for more of a…fiesta?? Then look no further than the Sonic the Hedgehog Piñata Kit. This kit comes complete with the pull-string piñata, a blindfold and buster, AND candy and toy fillers. Just hope Tails doesn’t get ahold of this thing and fly away. Photo booths are all the rage these days. They allow you all to let loose, throw on a silly hat and create some lasting memories. Make those memories larger than Robotnik with the Sonic Giant Wall Decals. It comes with a large action Sonic decal and the true-to-cartoon accent decals to go along with it. A bad host does not come to the party. A great host celebrates with everyone! A bad host yells at the children. A great hosts speaks respectfully to all guests. A bad host requires all guests leave any valuables and belongings as additional gifts for the birthday boy or girl. A great host never lets the guests leave empty-handed. Being a bad host is…well…bad. So be a great one! From treat bags to favor boxes, candies and stickers, we’ve got everything you could think of to keep your guests speeding away with wonderful memories and a full stomach. Favor boxes can be fun for everyone. Personalize them to each guest or fill them the same, up to you! Add in mini squirt guns, yo-yos, whistles, and many more. 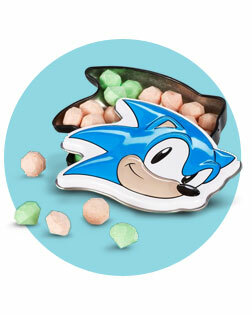 For those kids (and adults) who have a sweet and sour tooth, we have the candy to get your taste buds racing as quickly as Sonic’s foes after a wild encounter. The Chaos Emerald Sours are the perfect way to cap off a delicious meal. They also come in a festive Sonic the Hedgehog tin!